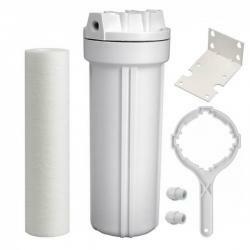 Osmio 2.5 x 10 inch Sediment Water Filter System The Osmio 2.5 x 10 inch Sediment.. 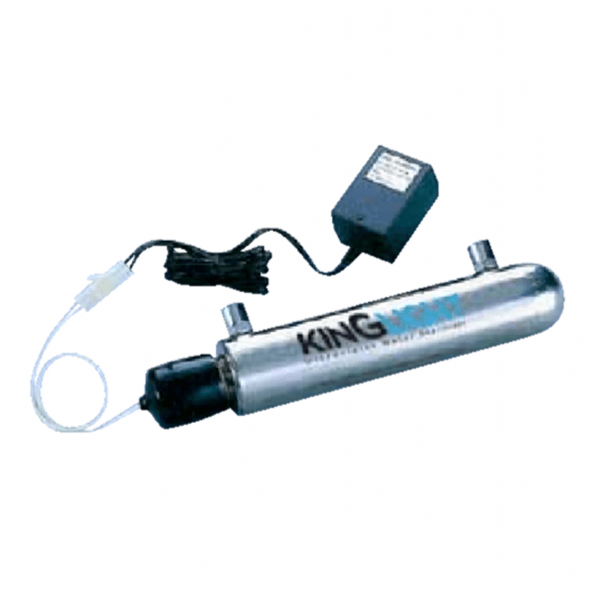 The KingLight UV system is an affordable yet high-performing UV Steriliser System from the removal of bacteria, coliform, e-coli and micro-biological issues with your water supply. The system is ideal for flow rates up to 4 litres per minute (1 US Gallons per minute) and uses 1/4" inlet and outlet ports and 6 watts power. The system has a handy lamp failure indicator which is a visual (LED) so you know exactly when the UV Lamp requires changing. The lamp life of the UV lamp is 9000 hours. 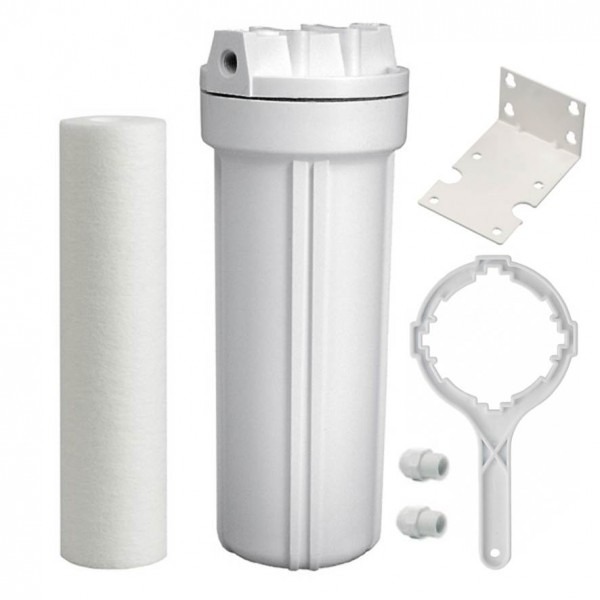 The system is usually installed at point or entry of after storage tanks and most commonly on private water supplies, but is also suitable for use on a mains water fed domestic application, providing additional safety against e.coli, coliform bacteria and other harmful viruses and bacteria. The system comes equipped with all parts and bulbs ready for installation. 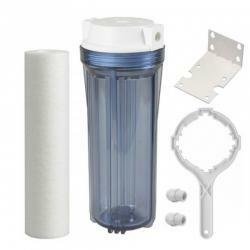 We highly recommend that a pre-sediment filter system is installed to ensure that the water going through the UV system does not contain suspended solids and sediments which could mean not all the micro-organisms are sterilised by the UV light. The sediment pre-filter is installed directly before this unit. Depending on the level of sediment in the water, a single or a double or even triple unit may be required. 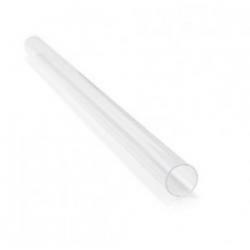 With all Ultraviolet systems it is necessary to have a prefilter. The reason is because microorganisms can often stick to suspended particles which in turn do not get exposed to the UV light and pass through unsteralised. 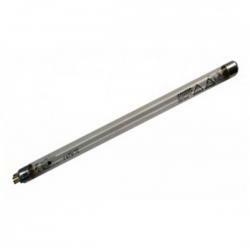 We recommend filtering to 5 microns where possible. There are two possible options; a white (opaque) housing unit and a clear (see-through) housing unit. Either one can be added to your order using the drop down menu selector above. A clear unit has the added advantage of enabling you to visually inspect the condition of your 5 micron sediment filter without the need to shut off the water supply and remove the housing bowl and then the filter. However, clear housing units must only be used if they are installed in a place which is not exposed to direct sunlight (i.e. closed cupboard space for example) as otherwise they may become a breeding ground for bacteria and possibly algae. The minimum dose is 300 J / m2 = 30 mJ/cm2 in our UV Kinglight series. What is a UV Water Treatment System? A UV Water Treatment systems uses a method known as Ultraviolet germicidal irradiation (UVGI). This method uses ultraviolet (UV) light at sufficiently short wavelength to kill microorganisms. 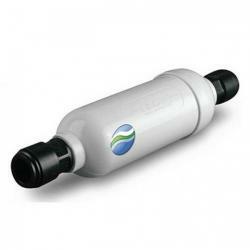 It is predominantly used in situations where there is a private water supply treatment requirement. UV effective against protozoa such as Cryptosporidium & Giardia lamblia? Yes, it is proven that UV is the best available technology to treat these protozoan cysts. In addition,the dose levels required to inactivate these cysts are actually quite low: less than 10mJ/cm² for 99.9% reduction of Cryptosporidium parvum and Giardia lamblia. Why disinfect a water supply? Disinfection is recommended for all water supplies that are not protected by a municipal water source. Unfortunately, due to the uncertainties that exist with some current water supplies, it is not necessarily safe to rely on the fact that water supplies “may be safe”. Yes, E. Coli requires a dose of up to 10mJ/cm² to achieve a 4 log reduction. UV disinfection typically offers 4 log reduction (99.99%) for both bacteria & most viruses. UV is more effective than chemical disinfection processes at destroying a wide range of viruses. See also pre-filtration. KINGLIGHT UVs are equipped with ballasts that emit an audible and visual LED indicating lamp failure. Is it necessary to disinfect a municipal water supply? Municipal water suppliers work hard to provide safe disinfected water – however, even in the most advanced & best “policed” areas of Europe and the USA there have been outbreaks of Cryptosporidium – it is worthwhile noting : only one cyst may cause vomiting & illness. Will a UV change the taste of water? No, UV is a physical process. The UV lamp should be changed every 9,000 hours – so approximately once per year. Yes, microbes can be shielded by suspended particles (sediment/turbidity), it is recommended that a pre-filter be installed of at least 5 microns, this should be changed every 6 months to prevent"mitosis", commonly called "grow through". Is the electrical supply adequate? Our UV systems are all supplied with a ballast that provides a constant output regardless of input frequency & voltage, which results in consistent UV output. Average households range from 15 lpm to 46 lpm, (lower where employed on RO filters) – all covered by our UV range. The KingLight UV System is an affordable yet high-performing Ultra Violet Steriliser System for the reliable removal of bacteria, coliform, e-coli and other micro-biological hazards from your water supply. 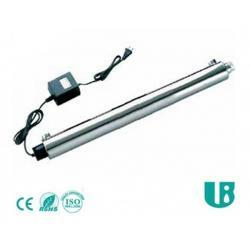 Lightbest UV8 (30 LPM - 8GPM) UV Steriliser System 30w The Lightbest UV sys..
Ultraviolet Pre-Filtration System 2.5" x 10" ~ White Housing ..
Ultraviolet Pre-Filtration System 2.5" x 10" ~ Clear Housing ..